This book is a collection of more than 100 problems selected from the examination questions for a graduate course in theoretical physics. Every problem is discussed and solved in detail. A wide range of subjects is covered, from potential scattering to atomic, nuclear and high energy physics. Special emphasis is devoted to relativistic quantum mechanics and its application to elementary processes: S-matrix theory, the role of discrete symmetries, the use of Feynman diagrams and elementary perturbative quantum field theory.The course attaches great importance to recitation sessions, where thorough problem solving becomes a true test of mastery of theoretical background.The authors are experts in their fields. A Di Giacomo taught "theoretical physics" for about 20 years. G Paffuti and P Rossi held recitations for several years. More recently, Haris Panagopoulos followed suit. 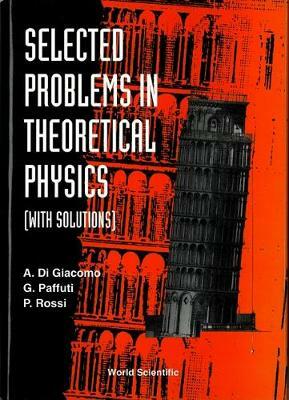 He assisted the authors in preparing this English version translated from the Italian.For physicists and especially for graduate and advanced undergraduate students in theoretical physics, this book is a positive guide in the intricacies of problem-solving. A further feature that adds practical value to this book is that most problems correspond to realistic physical processes and their numerical results are compared to experimental values whenever possible.